Football is upon us and with it comes all the excitement and renewed hope for fans across the league. A new season means any team can win, the unexpected is always a possibility and the sports gods have forgiven everything. 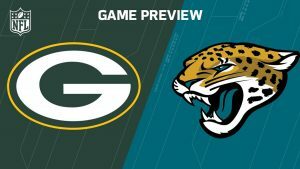 On Sunday the Green Bay Packers will travel to face the Jacksonville Jaguars for their first game of the season set to start at 1:00pm ET, the game will be broadcasted by FOX. The Jaguars are perhaps the team that has strived to make the most improvement this offseason, they invested a lot of money to fill obvious gaps and although nobody expects them to reach the playoffs they are considered one of the most up and coming teams in the AFC. The Packers are the obvious winner of this NFL football betting match and I won’t spend too much time talking of why, I am pretty sure we all know the reasons why they will win. Aaron Rodgers: I predict the Packers’ QB will throw a minimum of 300 yards and four touchdowns. How will he do this? Put simply he is an outstanding quarterback, of that there is no doubt, but the key here is Green Bay’s offensive team is healthy and well prepared with his running backs and wide receivers in top shape he should be able to open the season with a bang! Blake Bortles: I expect the Jaguars quarterback to have a great opening, I predict he too will throw some 300 yards for three touchdowns. The improvements in the Jacksonville roster will prove beneficial in this outcome. Sacks: Even though Green Bay has made improvements to their defensive line, there are still some holes to patch and some rough edges to polish, which will allow the Jaguars offensive tackles to do some damage. My prediction is Aaron Rodgers will get sacked some five times during Sunday’s game. Eddie Lacey: The Packers Running Back is looking lean and fit this season, after working with trainer Tony Horton (founder of P90X) and dropping the excess weight I predict he will accumulate at least 100 yards in this opening game. So bottom line bet Green Bay to win and the game to go over, and then head on over to the prop section at AceSportsbook.com and put my predictions to good use.